NEW DELHI:(PTI) The home ministry has ordered withdrawal of as many as 1,000 paramilitary personnel, including 300 women, deployed in Darjeeling to maintain law and order during the agitation for a separate Gorkhaland state. In a communication, the ministry said seven companies of the Central Reserve Police Force (CRPF), including three women companies, and three companies of Sashastra Seema Bal (SSB) personnel would be withdrawn from Darjeeling from tomorrow. The paramilitary personnel were in deployment in the hill districts of Darjeeling and Kalimpong, an official said. The situation in Darjeeling has improved in the past few weeks. Kolkata: The state government has strongly objected to the Centre's unilateral decision to withdraw 10 of the 15 companies of paramilitary forces from Darjeeling, days after a Sub-Inspector of the West Bengal Police was shot dead during raids at Tukvar near Patleybash to arrest GJM chief Bimal Gurung. 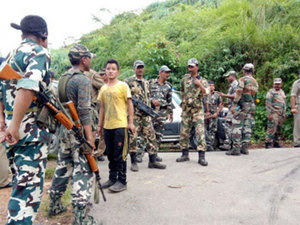 According to sources at Nabanna, the state government has received a communiqué on Sunday morning from the Ministry of Home Affairs stating that "seven companies of Central Reserve Police Force (CRPF) and three companies of SSB who are deployed in the Hill districts of Darjeeling and Kalimpong with effect from October 16. The remaining five companies CRPF will continue in the Hills to aid the police force till October 20". The top brass of the state police stated that "security grade in Darjeeling will get disturbed if the forces are withdrawn in such a situation when a desperate effort is being made to bring back normalcy". A senior official at Nabanna said that the state government wrote to the Centre only last week stating that the situation in the Hills at present doesn't permit withdrawal of even one company of the paramilitary forces and sought extension of their deployment in the area. The official said they are looking into the matter and discussing the issue. A high-level meeting will be held at Nabanna on Monday at which the next step of the state government in this connection will be taken up as it has already been assessed by the senior police officers that it would not be possible at all to tackle the situation with only four companies of the paramilitary forces. Sources said that the state government would write to the Centre regarding the same. It may be recalled that Chief Minister Mamata Banerjee had earlier held the Centre solely responsible for the violence taking place in Darjeeling as it does nothing apart from "politics of division". The state government officials have also raised objection over the Centre's unilateral decision of withdrawing forces despite repeated requests from the Bengal government for extension of the deployment of forces. Deployment of paramilitary forces, especially in Darjeeling, had been controversial since the matter had reached the Calcutta High Court in June following the Centre's delay. The latter had sent additional four companies of CRPF in Darjeeling only after being ordered by the Calcutta High Court on July 14 to bring an end to the violence that was then taking place in the Hills. The High Court's direction brought an end to the arguments that the Centre had raised against the Bengal government's request to deploy additional paramilitary forces in Darjeeling. Prior to the High Court order there were 11 companies of paramilitary forces in the Hills including three women units of SSB and three women companies of CRPF. The home ministry has ordered withdrawal of as many as 1,000 paramilitary personnel, including 300 women, deployed in Darjeeling to maintain law and order during the agitation for a separate Gorkhaland state.